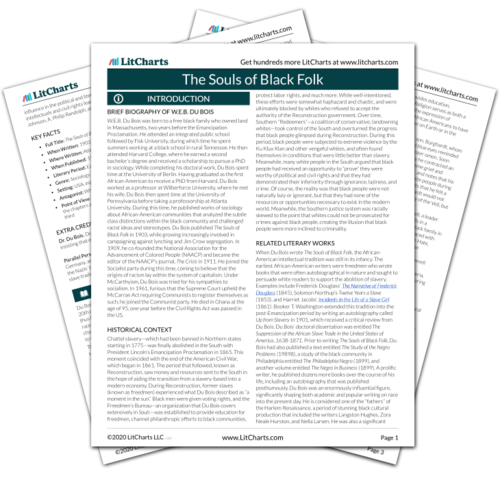 Instant downloads of all 945 LitChart PDFs (including The Souls of Black Folk). Du Bois introduces the book, explaining that it contains reflections on the meaning of being black in the 20th century. He assures the reader that the book will be of interest to them because “the problem of the Twentieth Century is the problem of the color line.” He asks that the reader forgive any of accuracies, and describes the book as merely a “vague, uncertain outline” of the lives of African Americans. From the beginning of the book, it is implicitly clear that Du Bois is addressing a white audience. His words suggest an imagined presumption that white people would consider issues of race and racism as irrelevant to them personally; however, Du Bois argues that this is far from the case. Du Bois briefly summarizes the book’s contents. Two chapters deal with the legacy of Emancipation. One examines the question of leadership, and features a critique of Booker T. Washington. In the next chapters Du Bois introduces the concept of “the Veil,” and discusses the issue of education. Further chapters cover the black peasantry, religion, and song. The book concludes with “a tale twice told but seldom written.” In the final page of the Forethought, Du Bois identifies himself as “flesh of the flesh” of black people, whom he categorizes as living under the Veil. The topics Du Bois addresses may at first appear to be a rather random assortment of different issues facing the African-American community. However, his overview of the book’s content also illuminates its key overarching themes, including problems within education and leadership, the pervasive burden of racial exclusion, and the idea that the “freedom” black people have been promised is something of an illusion. Seresin, Indiana. "The Souls of Black Folk The Forethought." LitCharts. LitCharts LLC, 30 Nov 2016. Web. 23 Apr 2019. Seresin, Indiana. "The Souls of Black Folk The Forethought." LitCharts LLC, November 30, 2016. Retrieved April 23, 2019. https://www.litcharts.com/lit/the-souls-of-black-folk/the-forethought.